Just reading Judith Durant's introduction pulled me into her soon-to-be-published book. I identified with her approach to knitting. A self-taught knitter, the 'how' always seemed obvious--manipulate the threads on two needles to achieve what looks OK. That appraisal--OK--is accurate. I just made it work. Probably because knitting isn't my only fiber focus, I realized rather recently that I'd neglected a wide range of knitting detail techniques. For example, Kfb (knit front and back) was my go-to for increases and K2tog, for decreases. I could do other increases and decreases, but never spent time to evaluate and match the most suitable technique for a given knitting project. I relied more on the final appearance rather than using standard knitting shorthand to achieve my goals. Clearly, I hadn't integrated the abbreviations with the techniques. A book such as Durant's, Increase, Decrease: 99 Step-by-Step Methods, to be published in May by Storey Publishing, will help me on my way. This is not a book to read on one sitting. At least it wasn't for me. Increase, Decrease is a reference book that I wanted to return to time and time again. 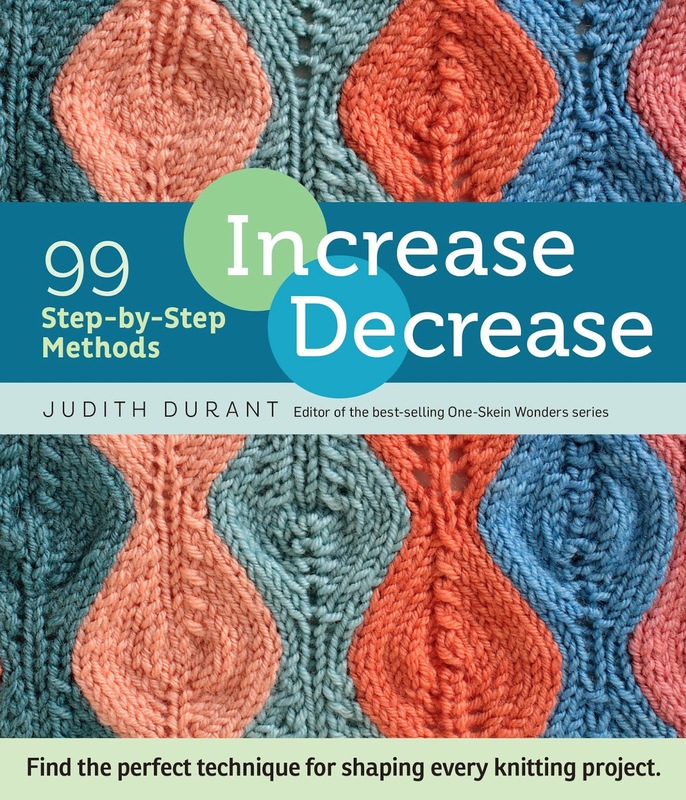 Durant, a book editor herself, organizes her 99 how-to's by types of increase and decrease methods (as the subtitle implies). Part One, for example, covers neutral increases--those that do not lean right or left. Do you want the increase to be visible? Use an open increase such as a yarn over? Or do you want it closed, meaning, invisible? From neutral increases, Durant moves on to cover right- and left-leaning increases, multiple stitch increases, and closed centered double increases. Part Two covers decreases--43 different ways to eliminate stitches from a row of knitting, to be exact. Single, double, and multiple stitch techniques? All there. I particularly liked her summary lists of characteristics and uses that accompany each technique. She lets you know what it will look like: Is it nearly invisible? Does it lean to the right or left? What does it look like on the right side versus the left? And where is the technique most appropriate: Decorative only? Lace work? Does it need to be paired? Mirrored? And more. Lots more. Part three combines techniques to detail how to use increases and decreases for decorative effects. Bobbles, closed-ring cables, rushing, textured patterns and lace are all covered. She concludes with a section on shaping textured, lace and color patterns. The text is extensively illustrated with close-up photos of swatches to accompany each description plus a series of images showing how to do the increase or decrease step-by-step--somewhat like a very slow motion YouTube video. I didn't count to confirm that there are really 99 methods, but knit and purl variations on each type of increase or decrease multiply each technique by two, just for a start. Some of the variations are minor, to be sure, but they are legitimate. The illustrations are generous, but I've often wondered why the publisher's graphics department doesn't retouch colors to make it very clear which thread is in front of another. Inevitably, no matter what yarn color or how big the photo, the threads visually merge. It's not really a big problem--but something I've long pondered. Increase, Decrease won’t be out until May, but I plan to add it to my library as it puts a wealth of technique information in one place.